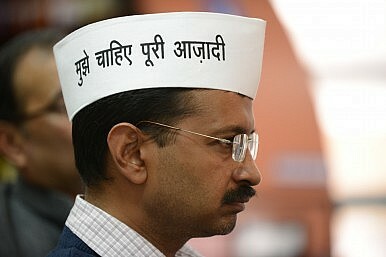 India’s regional elections mark the rise of the Aam Aadmi Party as a formidable political force. Holding a broom has never been as respectable and fashionable in Delhi as it is today. Whether in the posh neighborhoods of South Delhi or the slums, brooms have become a status symbol, a symbol of new political identity. Representing this identity is a burgeoning political organization, called the Aam Aadmi Party(AAP, meaning the Common Man’s Party) formed less than a year ago. It made history when on Sunday the AAP not only decimated the oldest party of the country, the Indian National Congress, in the Dehli assembly elections, but also checkmated the march of the opposition Bharatiya Janata Party (BJP). The results of the regional elections in the four states that announced results over the weekend put the BJP in the driving seat in three of them — Madhya Pradesh, Chhattisgarh and Rajasthan — and established the party as the single largest formation in Delhi. It is, however, the performance of the AAP in the capital city that stole the limelight from the right-wing party. The ruling Congress party, led by its veteran Chief Minister of 15 years, Sheila Dixit, faced a humiliating defeat with the party’s tally coming down to a meager 8 out of 70 seats in Delhi. Meanwhile the AAP, a political rookie, won a stunning 28 seats, almost on par with the BJP’s32. Interestingly, Dixit lost her seat to Arvind Kejriwal, the President of the AAP, who not long ago was a leading light in India’s anti-corruption movement. What does the victory of the new party symbolize? But there is a greater significance to be found in the emergence of the AAP as a political force in Delhi, where traditional parties like the Congress and BJP have dominated the political landscape for more than five decades. The very fact that the AAP managed to attract both the elite and marginalized sections of society in the metropolis demonstrates a new maturity in urban voters who are not swayed by class and ethnic identity. It also speaks to popular anger towards corruption and its identification with existing political players. If the victory of the AAP is the biggest takeaway of the recent regional elections, the rout Congress suffered is the biggest talking point. Opinion polls had predicted the party’s defeat in the state of Madhya Pradesh (MP) and Rajasthan but the magnitude of the defeat stumped even experienced election watchers. In Madhya Pradesh, the grand old party could not exploit the anti-incumbency mood against the BJP regime which has been ruling the state for ten years. It ceded further ground to the ruling party and managed to get only 58 seats in comparison to the BJP’s 165 out of 230 total in the legislative assembly. In Rajasthan, the ruling Congress lost heavily to the opposition BJP, winning only 21 seats out of a total 200 against its opponent’s 162. Chhattisgarh gave some hope to Congress in the initial rounds but it could not displace the entrenched right-wing party. In a closely contested election, the BJP won 49 out of 90 seats while Congress managed only 39, thereby losing the third election in a row in the Maoist-dominated area. The only solace for the harried party came from the northeastern state of Mizoram where the Congress managed to retain its bastion. What does the drubbing mean for the Congress and its leadership? How much did the BJP prime ministerial candidate, Narendra Modi, influence the outcome of results in the regional elections? If the sense of drift that has gripped the Congress continues for much longer, there is a strong fear that the party might badly lose next year’s general elections to the BJP, which seems to have got a spring in its step with its success in the assembly elections. The right-wing party is attributing the achievement to Modi. Despite the BJP’s position, analysts continue to cast their doubts on Modi. But regional elections ahead of the national election are not a proper barometer to assess the popularity of a party at the all-India level. In December 2003, the BJP won a series of assembly elections just a few months before the general elections but then lost the final battle in Delhi when BJP was ousted from power by a Congress-led alliance within four months. But 2013 is not 2003. The voters have different expectations now. People don’t hold the same level of trust in the established parties that they did a decade ago. The urban middle class is now a new powerful voice in the political arena. Therefore, history cannot be much of a guide in understanding the new currents in Indian politics. The AAP and its brooms symbolize this.